Gadgetarian is a utility that will let you use your Windows 7 gadgets on the desktop of Microsoft Windows 8 and 10. Gadgetarian adds gadget support on Windows 10. You won't need to restart your PC, just right click on the desktop to find the well known "Gadgets" option, along with "Personalize", and "Screen Resolution". Gadgetarian is not a separate program, it just enables the Windows native gadget functions, so that you can use all the Windows gadgets you are familiar with without compromising the integrity of the OS. It's very easy to install and you'll have the gadgets back on your desktop. The releases of Windows 8 and 10 brought significant changes to the popular operating system, both in looks and functionality. While a dozen new features were implemented, some 'old' ones that were present in previous OS editions are no longer available. Let's take, for instance, the support for sidebar gadgets. Officially supported in Windows 7 and Vista only, gadgets offer information at a glance, visible from the desktop, a feature that many users of Windows 8 and 10 would still like to enjoy. For those who want to try the newest Windows iterations, but keep their gadgets collection, here comes Gadgetarian. 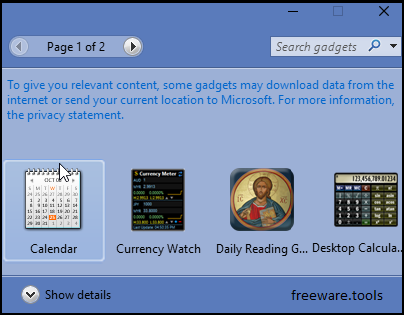 This lightweight application can enable support for gadgets in both Windows 8 and 10, allowing the host computer to recognize .GADGET files as native. In other words, you can have your gadget collection back even if you decided to leave Windows 7 and upgrade to 8 or 10. Deployment is easy, only requiring you to click a few 'Next' buttons. Just run the installer and follow the on-screen instructions. The great thing is that you don't even have to restart the system for the changes to take effect. Once Gadgetarian is installed, the 'Gadgets' option is added to the context menu. All you have to do is right-click on the desktop to see and access it. Gadgetarian comes with a collection of gadgets meant to improve your productivity, but any of them can be uninstalled and removed with ease. New gadgets can be installed just like in Windows 7, just by double-clicking on them. To conclude with, Gadgetarian is a nifty piece of software that makes it possible for you to have the sidebar gadget you were used to in Windows 7 on Windows 8 or 10. It enables you to build a comfortable working environment, allowing the use of the desktop gadgets you like. Practically, it re-enables the native gadget support of Windows, but without affecting the functionality of the system.